I was so happy when we moved into our house and discovered that the backyard was covered in calendula flowers! I use this flower in so many of my herbal preparations because it’s a wonder plant, full of so many benefits. 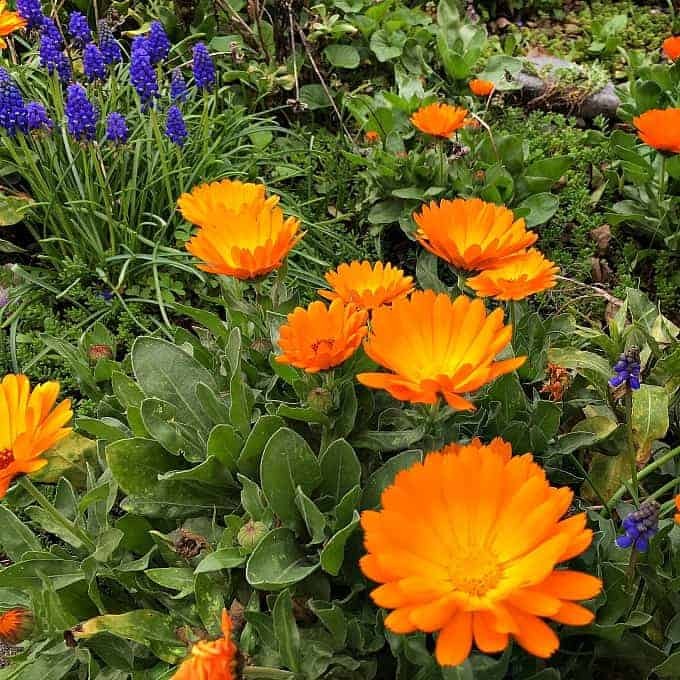 Calendula is a plant that everyone should have in their yard, for multiple reasons. First and foremost, it’s beautiful! It’s edible, easy to grow, and readily reseeds itself year after year. It’s also a powerful medicinal, and is one of the top herbs that I would highly recommend everyone having on hand. 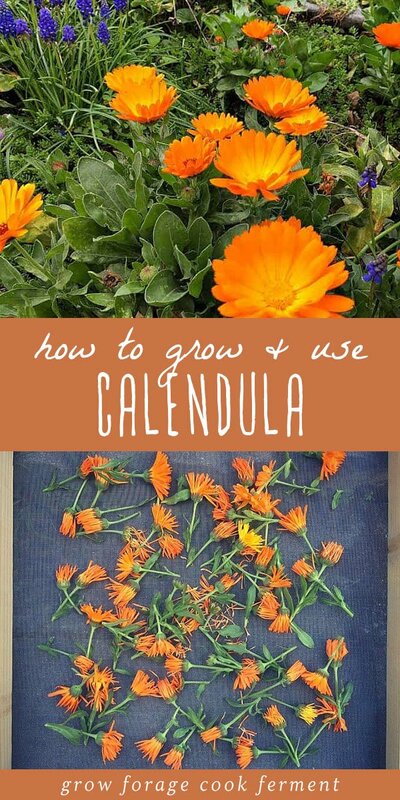 Here is how to grow and use calendula. To some people, calendula is considered “weedy,” but I always take that term with a grain of salt. Many weeds are beneficial in some way or another, and rarely are they as beautiful as calendula is. It’s actually a plant that I have grown from seed for the past few years. It’s super easy to grow, and there several different varieties. The seeds have a distinct curved shape, they almost look like little worms. Calendula grows well in containers, and is often called “pot marigold,” but it shouldn’t be confused with regular marigolds which are toxic. They are in the same family, but Calendula officinalis is the one you want for its edible and medicinal benefits. The most common varieties are orange or yellow, but they come in many other colors and varieties. I often grow a mix just for fun. Calendula is an annual, but will readily reseed itself and often come back year after year. You never know where it will pop up! Our yard is covered with them, but it doesn’t bother me any. The flowers are edible with a slightly peppery flavor, and are a tasty and beautiful addition to salads or used as an edible garnish. They are also wonderful in desserts such as these calendula and thyme shortbread cookies! 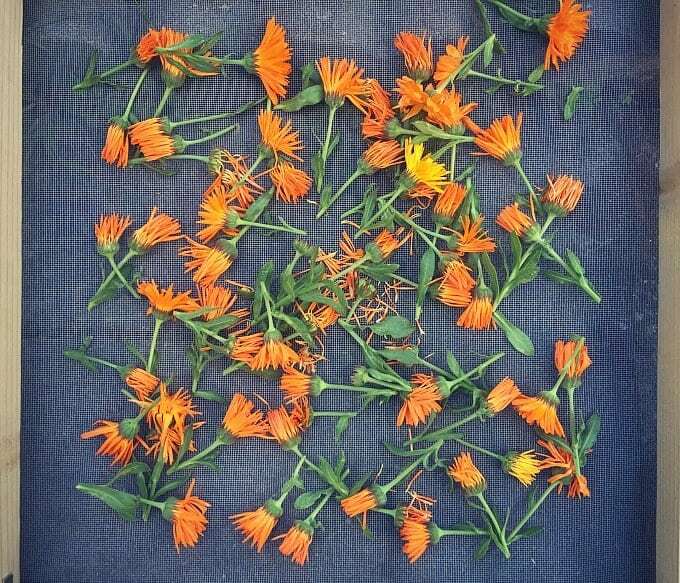 The main way to preserve calendula flowers for use in herbal preparations is to dry them. You can do this by hanging them upside down in bundles, putting them in a dehyrator (Excalibur brand is best), or on a herb and flower drying screen. 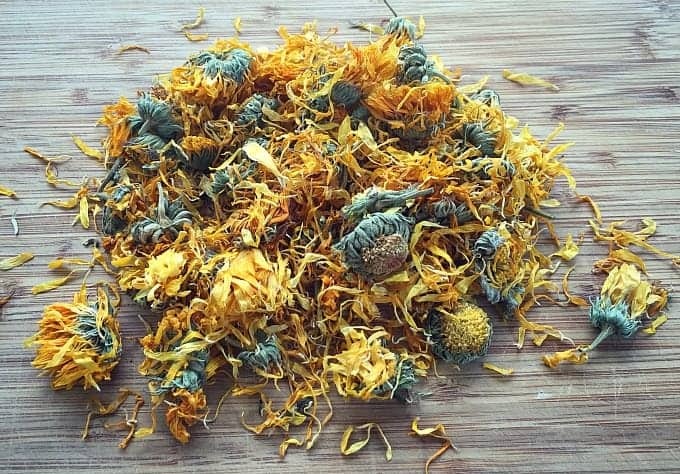 You can also purchase dried calendula flowers from Mountain Rose Herbs if you don’t have any to dry yourself, or if you don’t have enough. Many herbal preparations use quite a bit, and it can sometimes be hard to grow the amount you need. You might also be able to find them in the bulk section of your local natural grocery store. Calendula is great for the skin, and is well known around the world for its wound healing properties. It may be beneficial for cracks, scrapes, minor burns, rashes, chapped lips, and pesky bug bites. Calendula is most commonly made into a healing salve or calendula cream for this purpose. You can also make calendula lotion bars, which are amazing for dry skin! 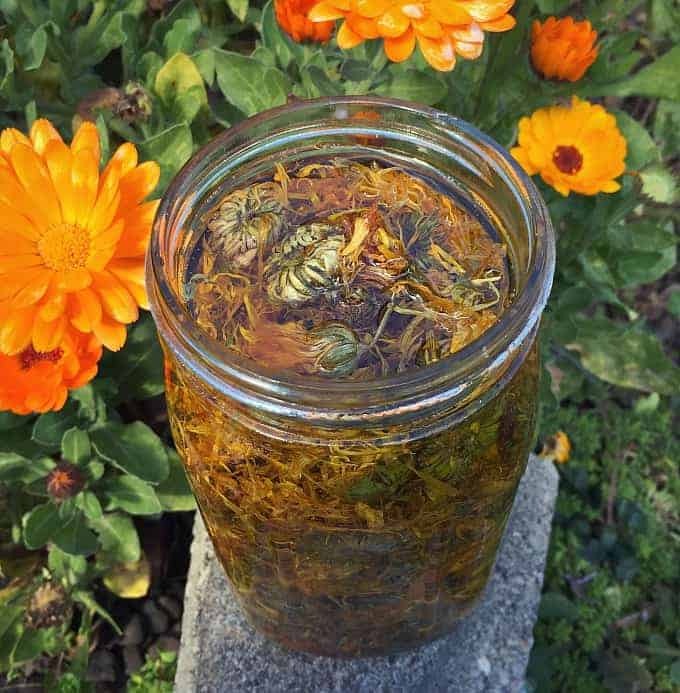 The first step in making calendula salve, cream, or lotion bars is to make an infused herbal oil. 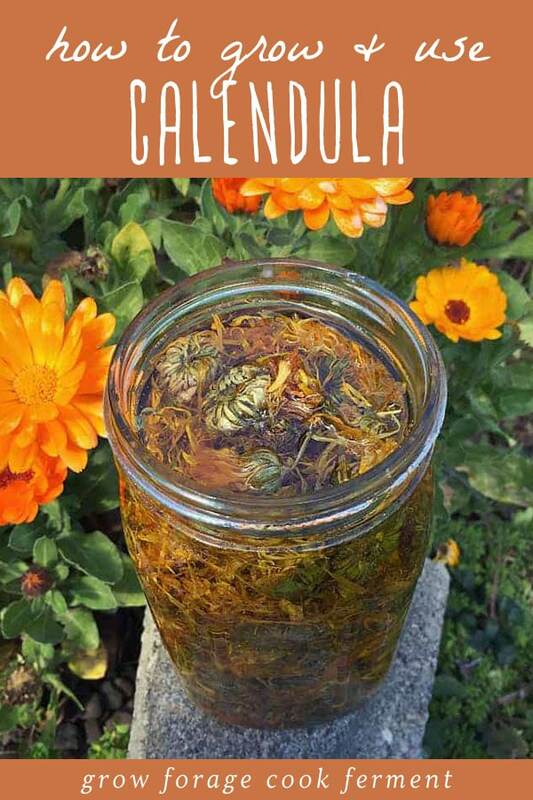 Calendula oil is one of my favorite infused oils to make, not only is it highly useful to have around, but it’s also gorgeous enough to keep on your windowsill. You can also make a calendula infusion, which is basically a strong tea. This can be used on minor skin ailments, in a bath, or as a mouth and throat gargle. I made a calendula infusion first when I made my calendula soap. You can read more about how to use calendula tea from The Nerdy Farm Wife here: 14 Uses for Calendula Tea. Calendula flowers have also traditionally been used to make a natural yellow dye, for food, fabrics, and yarn. How cool is that? So much better than the synthetic stuff. 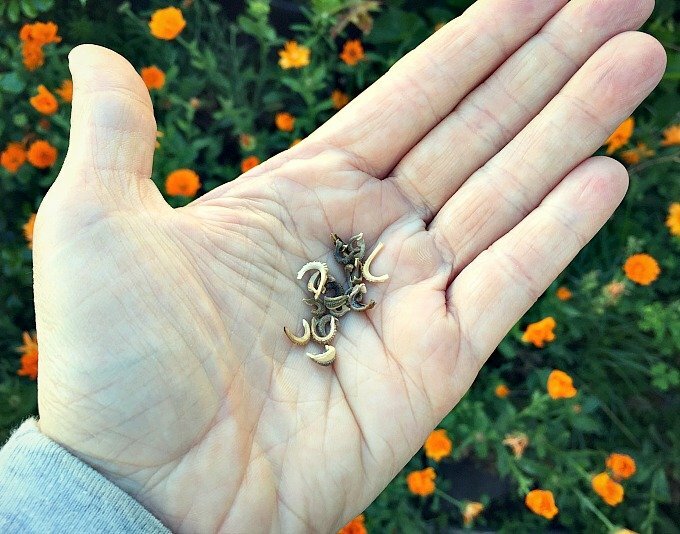 Basically, there’s no reason why you shouldn’t be growing calendula! The more I learn about herbs and their healing benefits, the more excited I get about the amazing possibilities in the natural world. If you’d like to learn more about herbs, I highly recommend taking a course from The Herbal Academy. I’ve already taken the Intro to Herbs Course and *loved* it, and now I’m just starting the Intermediate Course. So worth it! Does your news letter cost anything? I’m so happy I found your site. I’ll eat any flower, bug ,grass, leaves, dirt, bark that GOD provides for us. Have you created a book on the benifits of candeula and other wild flower? I’m always looking for new recipes and sources. Please let me know. I’m excited, Hairy Mary! 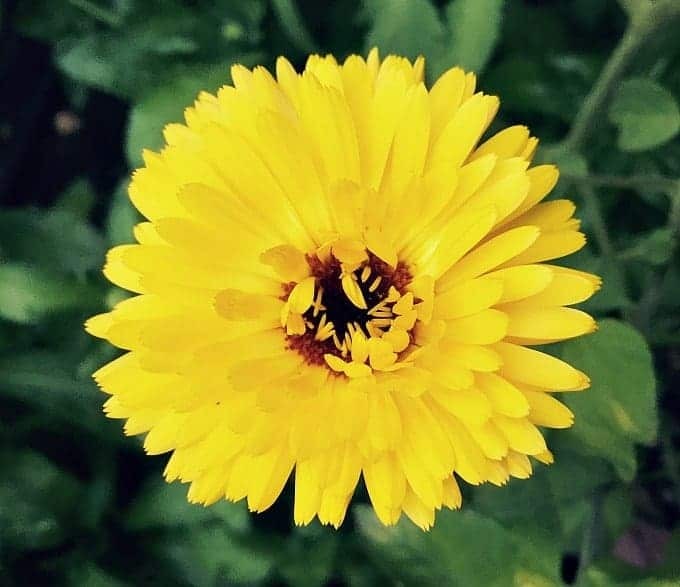 Tagetes aka the common marigold is not toxic …I was so happy to see your article on calendula but when writing an article and you refer to something as toxic ,you should research first as your credibility for calendula or anything else is now a question. Hi there! Interesting read as I raise Calebdula on my flower farm! It’s an absolutely amazing and beautiful flower. 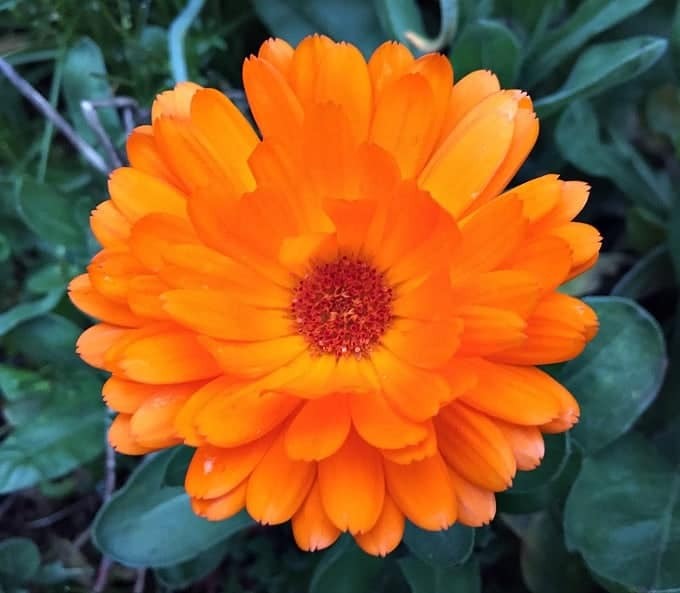 Thanks for posting the use of Calendula. Natural remedies are the best. Hello! I was wondering if you could use calendula leaves as well as the flowers? Thanks again Colleen! Q: Can Calendula grow in the south (FL)? Your article is very interesting. I’m beginning to get interested in natural remedies and it amazes me that what I’ve often thought are ‘weeds’ are really beneficial to us! Thanks for the information!